This article is long, so I’ll spare you a lengthy intro. Here’s everything you should need to know in order to dominate your Week 14 DFS tournaments and cash games. Sam Darnold (DK: QB31, FD: QB22) will start this week over Josh McCown, but I suppose that doesn’t really matter too much for fantasy. Darnold goes up against a Buffalo defense that ranks best in schedule-adjusted fantasy points per game to opposing quarterbacks, and second-best to opposing wide receivers. Marquise Goodwin (DK: WR29, FD: WR60) is expected to play this week, but Pierre Garcon has been ruled out. Dante Pettis (DK: WR36, FD: WR34) remains in play, but gets dinged somewhat by Goodwin’s return. Over the last two weeks, Pettis ranks fourth among wide receivers in actual fantasy points and 25th in expected fantasy points. However, I suspect George Kittle (DK: TE4, FD: TE3) deserves a bump up based on this news. He saw good volume while Goodwin was out but was far more productive while Goodwin was active. Perhaps with Goodwin’s return, defenses will be more fearful of him as a deep threat, opening up more room underneath for Kittle. Emmanuel Sanders is now on IR, making Courtland Sutton (DK: WR33, FD: WR31) a top value play. More on him later. James Conner is out for Pittsburgh and Matt Breida is out for San Francisco this week. More on Jaylen Samuels (DK: RB40, FD: RB56), Stevan Ridley (DK: RB52, FD: RB62), and Jeff Wilson (DK: RB37, FD: RB30) later. Jimmy Graham (DK: TE8, FD: TE10) and Randall Cobb (DK: WR40, FD: WR60) will play Sunday against the Falcons. Graham saw 11 targets last week but is still risky dealing with knee and thumb injuries. Cobb is worth overlooking, as he hasn’t exceeded 40 yards since Week 1. Joe Flacco is questionable for Sunday’s game against Kansas City, but even if he’s active he’ll be backing up Lamar Jackson (DK: QB12, FD: QB12) in Arrowhead. That means Baltimore’s wide receivers are too risky to play this week, despite the soft matchup. Sammy Watkins has been ruled out for the Chiefs, and the newly signed Kelvin Benjamin is expected to be inactive. This boosts Travis Kelce (DK: TE1, FD: TE1) and Tyreek Hill (DK: WR6, FD: WR), and especially Chris Conley (DK: WR55, FD: WR77). More on them later. Mo Alie-Cox and Dontrelle Inman out for Indianapolis, boosting Eric Ebron’s (DK: TE3, FD: TE5) stock. T.Y. Hilton (DK: WR15, FD: WR10) is expected to play according to some accounts but might be a true game-time decision according to others. If he’s out, Ebron approaches must-play territory, and Ryan Grant becomes a top value play. If Hilton is active, he deserves consideration, though his risk of busting will be higher than typical. Cleveland CB1 Denzel Ward is out, which boosts D.J. Moore’s (DK: WR20, FD: WR20) stock. More on him later. Miami CB1 Xavien Howard is out for Sunday, boosting Josh Gordon’s (DK: WR18, FD: WR18) fantasy stock. 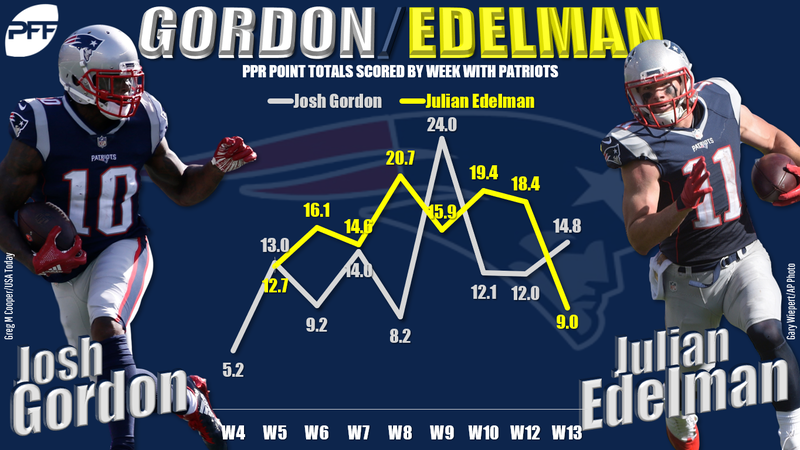 Still, Julian Edelman (DK: WR11, FD: WR15) has bested Gordon in expected fantasy points in seven of eight games they’ve played together this year (and in actual points five of eight). Given projected gamescript and recent usage, Gordon is not a top play. Keke Coutee (DK: WR36, FD: WR33) is a game-time decision this week. If he’s out, boost DeAndre Hopkins (DK: WR8, FD: WR3) slightly. Melvin Gordon has been ruled out for Week 14. Austin Ekeler (DK: RB13, FD: RB15) and Justin Jackson (DK: RB37, FD: RB62) are vaguely in play this week. Ekeler will get the start, but it sounds like Los Angeles will opt to go with a committee between the two running backs, making Jackson the better value. DeSean Jackson has been ruled out for Sunday’s game against the Saints. More on what this means for Mike Evans (DK: WR9, FD: WR9), Chris Godwin (DK: WR24, FD: WR31), and Adam Humphries (DK: WR24, FD: WR19) a little later. Christian Kirk is out for the Cardinals. This means we’ll have to consider Larry Fitzgerald (DK: WR24, FD: WR22) this week. He’s seen only 12 targets over his last three games but does have five touchdowns across his last six. He also has a soft matchup, as Detroit is giving up the seventh-most fantasy points per game to opposing slot wide receivers (where Fitzgerald runs 75% of his routes). Kerryon Johnson has been ruled out for Week 12, which means LeGarrette Blount (DK: RB36, FD: RB30) is sort of in play on FanDuel. Across two losses over the past two weeks, Blount totals 36 touches, 164 yards, and two touchdowns. Detroit is favored by three points this week against a Cardinals defense that is giving up the most rushing fantasy points per game to enemy running backs. Michael Gallup, Danny Amendola, Seth Roberts, Darius Slay, Michael Roberts, Matthew Stafford, Robby Anderson, Isaiah Crowell, Doug Martin, and Josh Doctson are all listed as questionable but expected to play. For cash games and single-entry tournaments, the winning approach this season has been trying to get as many of the high-priced bell-cow running backs into your lineups as possible. That helps make all of Ezekiel Elliott (DK: RB3, FD: RB3), Christian McCaffrey (DK: RB1, FD: RB1), Saquon Barkley (DK: RB2, FD: RB2), and Alvin Kamara (DK: RB4, FD: RB5) (in that order) very strong plays this week. It will be exceedingly difficult to fit more than two into your lineup on DraftKings, but it’s a good deal easier on FanDuel. Since Week 8, McCaffrey and Elliott rank first and second in fantasy points per game and expected fantasy points per game. For the year, they lead all running backs in expected fantasy point market share, snap share, carry share, and target share. I’m expecting Cam Newton to lean heavy on McCaffrey through the air again this week, as he’s dealing with a shoulder injury that could suppress his average depth of target. This week’s matchup also implies good usage – Cleveland is giving up the seventh-most fantasy points per game to opposing running backs but ranks top-10 to all other positions. Elliott is averaging an absurd 22.8 carries and 6.8 targets per game over his last four games. That’s just about the best I’ve ever seen from a running back through any four-game stretch. He gets an Eagles defense that has given up 35.0 fantasy points per game to running backs over their last five games. Barkley ranks behind only Todd Gurley in both expected and actual fantasy points per game this year. Nothing really stands out about the matchup on paper, but, as Barkley proved again last week, matchups have been wholly irrelevant for him all year. That said, I do wonder if the fact that the Giants are favored (by 3.5 points and against Mark Sanchez) might be working against him this week. Barkley has fared much better for fantasy when playing from behind. Alvin Kamara has a massive over/under working to his advantage, as well as a good matchup – Tampa Bay is giving up the fifth-most fantasy points per game to opposing running backs. Still, he ranks just 10th among running backs in both expected and actual fantasy points per game since Mark Ingram’s return. He’s now who he was last year – a bet on efficiency rather than volume. I like Aaron Jones (DK: RB7, FD: RB9) as an anti-recency-bias play, following a coaching change and in a good matchup, but I think I prefer Sony Michel (DK: RB14, FD: RB13) on both sites. Excluding a Week 7 game where Michel exited early due to injury, he’s averaging 19.3 carries, 1.17 expected touchdowns, 14.8 expected fantasy points, and 15.2 actual fantasy points per game over his last six. Over this span, that ranks third, second, 13th, and 18th, respectively. Serving in the LeGarrette Blount role, he has an ideal matchup this week, favored by seven points against a Miami defense that’s giving up the fifth-most rushing fantasy points per game to opposing running backs. I think Samuels is a great play this week, with James Conner out, but probably not a must-play like we’ve seen from Pittsburgh’s backup running backs in the past (like DeAngelo Williams). Though Samuels has been named the starter, it seems clear, per this tweet, he’ll be working in a committee with Stevan Ridley. I think Ridley, who has had more touches than Samuels this year, could receive the majority of the team’s carries, though Samuels (who had more career receptions than rushing attempts in college) is likeliest to dominate work as a receiver. That means Ridley could possibly have the better matchup, as Pittsburgh is favored by 10.5 points against Oakland’s run-funnel defense. Still, I suspect Samuels will have the better role overall and be more productive. Even if it’s a 60/40 split in terms of usage (expected fantasy points), which I think is probably too low, Samuels still feels like a lock to hit value. Matt Breida played on only 10 snaps in Week 13, nursing an ankle injury, and has already been ruled out for Week 14. In relief, Wilson played on 54 of the other 66 snaps, drawing 15 carries and nine targets, while scoring 21.4 fantasy points. That’s RB1 volume and production, but it’s not a lock his role is as good this week. San Francisco has utilized a committee approach all year, with Kyle Juszczyk occasionally mixing in. Still, there’s a strong possibility he does receive a bell cow workload, and though his matchup appears neutral at best, I like him slightly more than Samuels this week. Since complaining about a lack of targets in Week 7, Keenan Allen (DK: WR10, FD: WR8) has seen a substantial uptick in usage. Since then, Allen ranks top-three among all wide receivers in targets per game (11.0), expected fantasy points per game (18.7), and actual fantasy points per game (23.0). His 19-target game in Week 13 came on Monday night, which means it wasn’t factored in to Week 14’s salary, cementing his status as one of the better values on the slate. The matchup is fairly soft as well, with Cincinnati ranking 12th-worst in fantasy points per game allowed to opposing slot wide receivers. Davante Adams (DK: WR3, FD: WR2) ranks fifth in expected fantasy points per game and second in actual fantasy points per game. That is despite facing one of the league’s toughest cornerback schedules, which includes shadow games against all of Tre’Davious White, Darius Slay, Marcus Peters, Xavier Rhodes (x2), Stephon Gilmore, and Patrick Peterson. Although he’s seen slightly better usage in these tougher matchups (18.2 vs. 17.5 expected fantasy points per game), he’s been more productive across his other five games (24.3 vs. 21.0 actual fantasy points per game). That’s good news this week, against an Atlanta defense that doesn’t shadow. Like Adams, DeAndre Hopkins (DK: WR8, FD: WR3) has had one of the league’s toughest cornerback schedules. To date, Hopkins has been shadowed by Stephon Gilmore, Janoris Jenkins, Tre’Davious White, Jalen Ramsey, Xavien Howard, Chris Harris Jr., and Josh Norman. In those games, he’s averaged 18.6 fantasy points per game. In all other games, he’s averaged 21.7. Indianapolis hasn’t shadowed once this year, which means, if Andrew Luck keeps things close, Hopkins appears poised for a monster game. 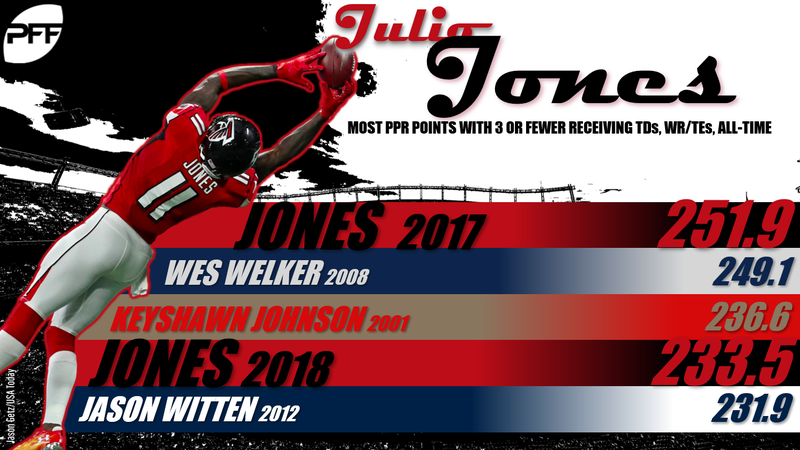 Julio Jones (DK: WR7, FD: WR4) should draw lower ownership than typical after last week’s dud in a brutal matchup against Baltimore, but he has looked exactly like the old Julio Jones in recent weeks. Since Week 6, he’s averaging 19.8 expected and 20.8 actual fantasy points per game. Those numbers rank best and fifth-best, respectively, over this span. This week he draws a Green Bay defense that ranks fifth-worst in schedule-adjusted fantasy points per game to opposing WR1s. Over the past three weeks, Moore ranks eighth among wide receivers in fantasy points and 12th in targets. With Greg Olsen now on IR, there’s little reason to suspect things slow down this week, and especially not with Cleveland CB1 Denzel Ward ruled out. Even with Ward healthy, Cleveland already ranked third-worst in schedule-adjusted fantasy points per game to opposing WR1s – and, in recent weeks, that’s been Moore and not Devin Funchess. Since Cooper’s first start in Dallas (Week 9), he ranks top-10 among wide receivers in both expected and actual fantasy points. This week, he draws an injury-plagued Philadelphia secondary that is surrendering the second-most fantasy points per game to opposing outside wide receivers (where Cooper runs 84% of his routes). Emmanuel Sanders heading to IR he leaves behind 8.2 targets per game and a 23% target market share. This already follows the losses of Demaryius Thomas and Jeff Heuerman. So now, excluding Sutton, Denver is without their most, second-most, and third-most-targeted receivers. Denver won’t have much of a choice but to look Sutton’s way often, and especially so if San Francisco runs away with the lead (the 49ers are currently 3.5-point favorites). The matchup also seems to work in his favor as well. 41% of Sutton’s fantasy points have come on deep passes, and San Francisco ranks worst in deep passer rating allowed (129.9), second-worst in fantasy points per game allowed to wide receivers on deep passes (11.1), and third-worst in deep fantasy points allowed per target (3.14). In the four games DeSean Jackson or Evans has missed over the past two years, Godwin averages 16.6 expected and 17.5 actual fantasy points per game. Across these four games, he’s also averaged 120.8 air yards, 8.5 targets, 1.3 end-zone targets, and 2.0 deep targets per game. Essentially, that’s good for low-end WR1 numbers. Godwin is our 12th-highest-graded wide receiver this year and ranks 23rd (of 93 wide receivers) in yards per route run. This week, with Jackson confirmed out, he draws a New Orleans defense that is giving up the most fantasy points per game to opposing outside wide receivers and the most schedule-adjusted fantasy points per game to opposing WR2s. I prefer Godwin to Mike Evans (who we expect to draw shadow coverage from Marshon Lattimore) and Humphries, but it wouldn’t shock me if Humphries posted yet another solid game. Humphries ranks seventh among wide receivers in fantasy points since Week 8, averaging 17.1 fantasy points per game. However, volume has not been as good, ranking 18th, and averaging 11.9 expected fantasy points per game. This implies a looming regression, and his matchup isn’t as strong as Godwin’s – the Saints are “only” giving up the 13th-most fantasy points per game to opposing slot wide receivers, though he too is solidly in play. Although the production hasn’t really been there, Ellington has seen target totals of nine, seven, and 10 since Marvin Jones’ injury. With Patrick Peterson likely to shadow Kenny Golladay on the majority of his perimeter routes, this should open up more opportunities for Ellington in the slot (49% of his routes). Arizona is already giving up the fourth-most fantasy points per game to opposing slot wide receivers. Since Week 6, Jones ranks 22nd among wide receivers in expected fantasy points per game (13.0). Although his production hasn’t been as good as his volume over this span, there’s good reason to believe both are better this week. The release of Kelvin Benjamin and Andre Holmes should result in more targets for Jones, as should this week’s matchup. The Jets are giving up the most fantasy points per game to slot receivers (where Jones has run 54% of his routes), but the 12th-fewest to outside receivers. 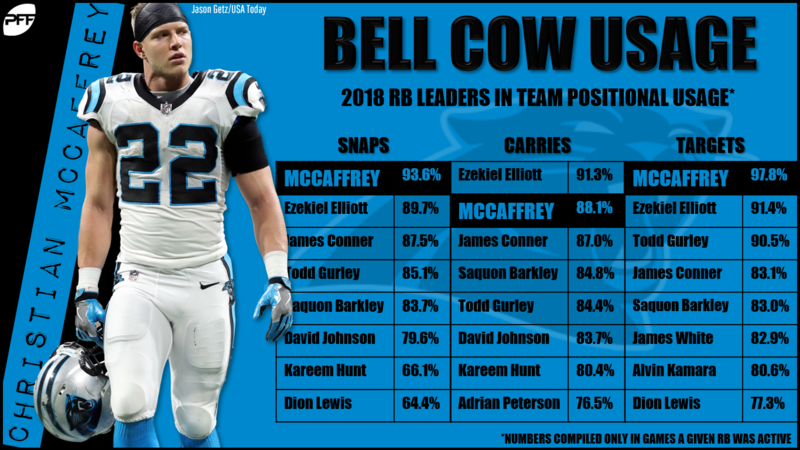 With Sammy Watkins and Kelvin Benjamin expected to be inactive, Conley becomes another top value-play. He’s played on 91% of the snaps over his last three games, averaging 5.0 targets and 13.7 fantasy points per game over this span. Baltimore is a tough defense for wide receivers, but this is the best offense for football, and he is still very mispriced. As I tried to show here, there’s a legitimate case to be made in playing a tight end in the flex on DraftKings. On FanDuel, where it’s much easier to fit three of the high-end bell-cow running backs, you probably don’t need to go that route. Sure, Kelce is the highest-priced tight end on both sites, but he’s actually still pretty cheap (and especially on DraftKings). Kelce ranks sixth among all slate-eligible receivers in DraftKings fantasy points per game (21.3), but somehow ranks just 13th in salary. You’d think then that he might have a tough matchup this week, but that’s only partially true. Although Baltimore is good overall, they’re fairly susceptible to tight ends. They’re giving up the 12th-most fantasy points per game to tight ends, but rank top-two against all other positions. In total, they’re surrendering 28.3% of their total receiving fantasy points allowed to tight ends, which ranks second-most among all defenses. Ebron is priced as the 22nd-most-expensive receiver on DraftKings, and the 23rd-most-expensive receiver on FanDuel. He’s averaging 15.3 fantasy points per game, which ranks third among tight ends, and would rank 21st among wide receivers. When Jack Doyle has missed time, Ebron averages 19.3 expected fantasy points per game, 10.5 targets per game, 106.0 air yards per game, and 1.5 end-zone targets per game. If over a full season, and among all receivers, those numbers would rank second, fourth, 14th, and first, respectively. On top of all that, his opponent this week (Houston) ranks third-worst in schedule-adjusted fantasy points per game allowed to opposing tight ends. With Doyle, Dontrelle Inman, and Mo Alie-Cox ruled out, (and T.Y. Hilton listed as a game-time decision), Ebron borders on must-play territory. Other: This week, Ebron is my favorite, followed by Kelce, but Zach Ertz (DK: TE2, FD: TE2) isn’t far behind. Baltimore is more of a tight end funnel defense than Dallas, but Dallas is also giving up the ninth-most fantasy points per game to tight end (14.3), while Baltimore ranks 12th (13.8). Kelce has outscored Ertz, but it’s close (20.1 to 18.9), and Ertz has actually seen better volume (16.8 expected fantasy points per game to Kelce’s 15.9). That said, Kelce gets the slight nod, because Ertz’s volume has been falling since the team acquired Golden Tate, while Kelce’s volume should rise with Watkins and Benjamin inactive. 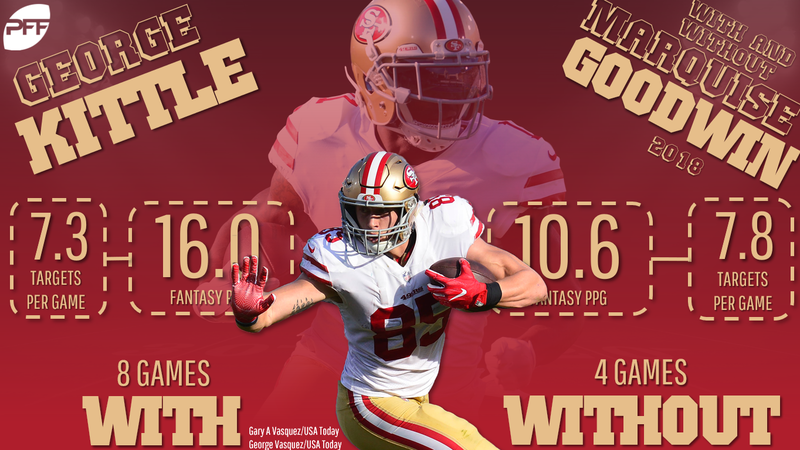 … George Kittle (DK: TE4, FD: TE3) is a step behind the other three in volume and production, but is still very much in play. If looking to go cheap at the position, I’d consider Matt LaCosse (DK: TE22, FD: TE27) who has a near-minimum price and should get a target-bump with Emmanuel Sanders out. The quarterback position is an absolute mess this week. There are legitimately 11 quarterbacks I’ll be considering. They are (in no particular order): Aaron Rodgers (DK: QB7, FD: QB7), Patrick Mahomes (DK: QB1, FD: QB1), Jameis Winston (DK: QB6, FD: QB10), Deshaun Watson (DK: QB8, FD: QB9), Philip Rivers (DK: QB4, FD: QB5), Andrew Luck (DK: QB8, FD: QB8), Drew Brees (DK: QB3, FD: QB3), Baker Mayfield (DK: QB10, FD: QB12), Lamar Jackson (DK: QB12, FD: QB12), Josh Allen (DK: QB15, FD: QB15), and even Mark Sanchez (DK: QB48, FD: QB29). With my own lineups I’ll be considering this position last and will be playing whoever fits best or whoever fits best with the receivers I’ll be playing. Regretfully, I’ll leave this portion of the analysis up to you this week, but that’s my advice: Build the rest of the lineup and fill quarterback in with what you have left.